Terceira, ( along with a few other islands ), is well known for bullfight by the rope ( Touradas á corda ). This very special event is unique to the Azores, and has been practiced since 16th Century. From May to October there will be about 250 events on the Azores. 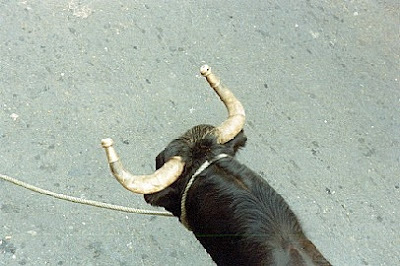 The bull is let loose with a very long rope around its neck, usually at the main road in a small village. Before every bull is getting out of a wooden crate, there will belaunched a small rocket which makes a loud noise. This signal indicates, that there is a bull on the street, and the game is ready to begin. The bull is guided by several experienced men, keeping a grip at the rope. The whole idea is, that the local young men now try to get as close to the bull as they dare, teasing the bull which is getting agitated. All this game is very amusing and dangerous, and in a way also an attempt for the local boys to impress the local girls. After a while the bull is taken back to the wooden crate as it arrived in, and another rocket will be launched, announcing a break in the game. Now it's time to move around, have something to eat, a drink ( or several ), or leave the village. This is an outstanding local event, and attracts many many people. As a tourist you should arrive in due time. Find a secure place with a good view. Usually there iare a total of 3-4 bulls in every event. To find out where and when this event take place, ask the tourist office or at the local bar. Every local knows. If there is bullfighting in the arena when you are there, you really must go there and try to get a ticket. There are bullfighter arenas on Terceira and Graciosa. It's a great opportunity to watch bullfight in another way than the Spanish. The bull is not to be killed. 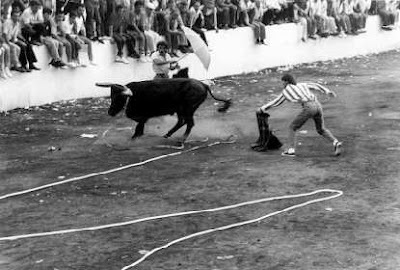 The Toreador will place small " blades " on the back of the bull like in Spain, but only until a certain point in the game. Then 6-7 other men enter the arena. One of them walks bravely and slowly towards the bull. 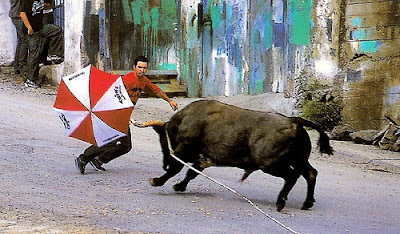 Now the bull starts running fast directly against this man to attack him. Just before the bull is hitting the man in the belly, he grab around the bulls neck with both arms, trying to stop the bull. Now the other men stand behind him, preventing him from falling. One man grabbing the bulls tail, forcing the bull turning round, and makes the bull stand still. To get the bull out of the arena, 3-4 cows now enter the arena. Of cause that interests the bull, who now follows the cows out of the arena. That's all. Hard to understand?. Well, it's hard to explain ! I find it very amusing to watch, and I can warmly recom-mend to go and see it. It's far more human to watch than Spanish bullfighting. After the game is over, the bull is taken to the vet to be taken care of. After this the bull continue its normal life in thecountryside.